A Game After A Playoff Type Performance, Bucks Play Like Lottery Team ~ The Bucky Channel - The World of Sports from Wisconsin's Perspective. So, how would Milwaukee respond after laying a whoopins' on Dallas? Lose by 30 themselves. Everything they did great the night before didn't show up last night as the Bucks drop to 21-25 in the 117-87 loss to the Atlanta Hawks. All you need to know is that the Hawks, not only out scored the Bucks but had less fouls, more blocked shots, more steals, less turnovers, more rebounds, more assists, shot and made more free throws, and had a better shooting percentage. Here's the Box Score for more grueling details. Charlie V was the lone bright spot hitting 5-6 threes and scoring 27 points. Redd scored 16. Nobody else was in double figures. Games like these, without Bogut, are games were RJ should be stepping up, but hes not. 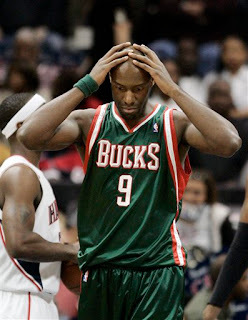 This is why I like Charlie off the bench, he takes shots away from the Bucks typical front line starters. Lastly, according to ESPN.com Michael Redd is the top trade target. Regardless if you like Redd or not, this CURRENT team is complete garbage without his scoring ability. Depending on what we get in return I would accept Redd's dismissal, but I have a feeling it isn't going to be much. Milwaukee Plays at home tonight against Sacramento at 7:30. The game is not on TV locally. TBC's Buck of the Game: Charlie Villanueva obviously, but he seems to be getting a bit too comfortable outside the arc, this could be trouble down the road. thanks for MU, Badgers, and Bucks updates. Wonder if anybody is interested in Redd now. Whoops.